Q: How many reciprocal reservations do I get each year? each of our 175+ locations around the country. Q: Is there a way to tell how many reciprocal reservations I have used at a specific club? Q: Will the Reservations Portal allow me to access more boats at non-home clubs? available on the day(s) you request. Q: What other benefits does this new system offer? level, many of our clubs have their own set of requirements for reserving/using their vessels. needed for your upcoming day on the water. Q: If I use all of my allotted reciprocal reservations at a specific club, can I purchase more? An exciting Military and 1st Responder Recognition Party will be held this Saturday (4/13/19) from 1 to 3 p.m at the Brand New Cape Cod Cottages located a 4425 Sea Mountain Hwy, Little River, SC 29566. There will be free waterway tours offered on boats provided by The Freedom Boat Club and by Myrtle Beach Watersports aboard the newly renovated Sea Thunder dolphin tour boat. Free hot dogs will be provided by Freedom Boat Club. We are thrilled to have partnered with Dave Priest of 99.5 WRRN, who will be providing live coverage of the events. The event will promote our community’s history and culture for our community and visitors alike. The Freedom Boat Club (located across the swing bridge from Cape Cod Cottages), has an exciting special offer for all buyers of a Cape Cod Cottage. Please stop by and see how convenient it can be to have a wide array of boats available to you in your own backyard. Sponsors include Freedom Boat Club, Cape Cod Cottages, the North Myrtle Beach Chamber of Commerce, the Little River Chamber of Commerce, Vietnam Veteran’s Association and the Military Officers Club. For additional information call 843-732-4711. The Relay For Life movement is the American Cancer Society’s signature fundraiser dedicated to helping communities attack cancer. From team members to volunteers, we all want to remember those we’ve lost, help those affected today, and give us a home team advantage against cancer. Through funds donated, time given, or awareness raised, our communities are teaming up to make a difference. When we rally together in the fight against cancer through this fun and inspirational event, we can accomplish anything. Freedom Boat Club has participated in Relay for Life of the Grand Strand for 13 years now and we have raised over $100,000 in the fight against cancer. Relay for Life takes place at Grand Park at the Market Commons this year in Myrtle Beach on May 4th beginning at 11am. Please join us at 710 Bowling for a team planning meeting for TEAM FREEDOM. To join TEAM FREEDOM or to make a donation please click here or go to www.relayforlife.org/mbsc. We are TEAM FREEDOM at the Grand Strand Relay for Life. Please RSVP with the number of people attending by calling 843-732-4711 or simply respond to this email. There is also a Relay for Life meeting for ALL teams on March 4th at 6pm but Freedom Boat Club will not be in attendance. Please feel free to attend! Logan’s Roadhouse 1136 Oak Forest Drive Myrtle Beach SC 29577. Show your Freedom Boat Club Pride and have some fun as we sport our green together. We’ll have a prize for the best dressed and most enthusiastic member. The parade is on March 16th and starts at 9am, you would need to be there by no later than 8:30am. More details about parking and our lineup number coming soon. 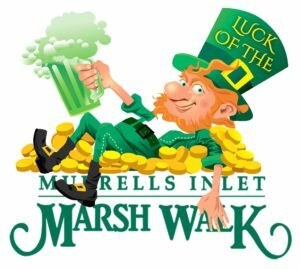 Grab your green gear and frolic down the MarshWalk for the 4th Annual Luck of the MarshWalk starting at 2pm. Three lucky leprechauns will win their very own pot of gold. Contestants will make their way up and down the MarshWalk collecting stamps on their stamp card from each location, all while enjoying drink specials, Irish-inspired dishes, and live music. Start at the Freedom Boat Club tent that will be located at the Crazy Sister Marina from 2pm-8pm. You will then pick up a stamp card to qualify to win from any of the eight MarshWalk restaurants. Final judging will be held on the Bovine’s back deck at 8pm. To win you must have your card stamped from each restaurant. • Registration Place – Meet Freedom Boat Club at the Crazy Sister Marina, look for our tent. Please RSVP by calling 843-732-4711 or simply respond to this email with the number of people attending. You read that correctly! DOUBLE REFERRAL FEES IN MARCH! We are paying Double Referral Fees in March so bring your friends, neighbors, co-workers, anyone interested in joining Freedom Boat Club and if they join we will give you $400 instead of the normal $200. Not only that but if they join you will be invited to our VIP Member Referral Party where we will buy you dinner and drinks and have a raffle for free monthly dues. The 1x Entry Fee increased from $3900 to $4900 for Monday – Friday and it went from $5900 to $6900 for the 7 day a week membership on March 1st. Your referrals can still get in this month with the old rates but only until the end of March so spread the word. Freedom Boat Club has an odd tradition where we burn our socks at the Spring Equinox. This year is no exception but I’m super excited to announce that the man who created the Burning of the Sock, Capt. Bob Turner, will be out our North Myrtle Beach ceremony this year!! He started the tradition in Annapolis, MD back in the 1980’s and has since retired to Pawely’s Island. He is already committed on the first day of Spring so we are going to do our Burning of the Socks on the last day of Winter, March 19th. Join us at the Freedom Boat Club located at Habourgate Marina Tuesday, Mach 19th from 5 pm to 7 pm for our “Burning of the Socks” celebration. Please RSVP by calling 843-732-4711 with the number of people attending. You haven’t been on a boat since last boating season. Tension is mounting and you have little energy within you. You are eating more to relieve stress. 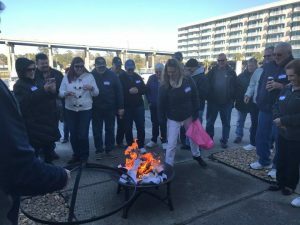 Yes, you can both eat more and relax by burning your winter socks at the Freedom Boat Club’s “Burning of the Socks” celebration on March 19th scheduled on the last day of winter. It’s become a coastal tradition, dating back to the early 1980s, starting in Annapolis. There, Capt. Bob Turner, who managed a boatyard, got tired of the winter blahs. While working on other people’s boats all winter, his socks collected sawdust, bottom paint, caulk, fiberglass resin, and other boat yard leavings. Dust off your flip flops and join us for the first member boat trip of the season! We will depart the docks from Harbourgate Marina at 11am and return around 2pm. Members are responsible for a share of the gas and their lunches, FBC will provide appetizers for the group to share. We will also provide water. soda and beer for the boat ride there and back. Guests are welcome to attend for a $10 cash charge that will be collected at the restaurant. This will cover their cost of fuel and a share of the appetizers. Guests are responsible for their own meals. Please bring the normal things you would for a day on the water. No coolers please. Do you enjoy attending FBC social events and meeting new people? Do you enjoy getting out to the festivals and talking to people? 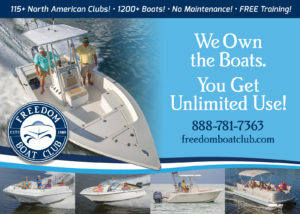 Do you love your Freedom Boat Club? If you answered yes to any of the questions above you could be the next Freedom Boat Club Ambassador. 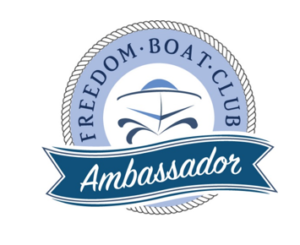 Freedom Boat Club will kick off the brand new Ambassador Program on March 28 at 6pm with a Celebration dinner, locations to be announced but save the date! All Ambassadors Will Be Given the Following Special Gifts From Freedom Boat Club as Our Very Special Thanks for Participating in the Ambassador Program! And of course, you’ll receive LOTS of LOVE and appreciation from your Freedom Boat Club Family! Freedom Boat Club is donating a one-year membership to St. Michael’s Christian School in Murrells Inlet. Because of our generous donation they have given us a table of 8 at their event. We would like to extend the invitation to you. We only have 6 spots at the table so it’s on a first come, first served basis. Please call Karen at 843-732-4711 if you would like to attend.